And, by 2002, the Linux market share of the Web server operating system market stood at about 25%, compared to Microsoft's 50 percent. Microsoft's market share appeared to peak at 38% in 2007, and has been in steep decline over the last two years. If one looks at the numbers in the Fortune 500 space you still don't see numbers approaching 50%. 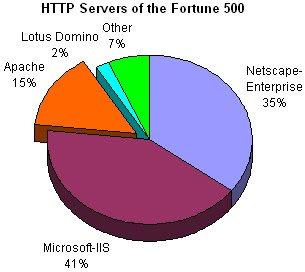 This July of 2000 study reported on Server Watch shows Microsoft's share at 41%. So what's the point of all this? Got me. I just don't like to see errors propagated. Maybe there's an explanation. I'd love to know where Chris Anderson got his number. A minor point I know, in what is a very well researched and excellent book in all regards. You are comparing apples and oranges. Apache is not an operating system, Windows is not a web server. Perhaps some people are running Apache on Windows. I can see that, and I actually considered that. Chris Anderson mixed Web server and operating system by using them in the same sentence. So you think he was talking about operating systems that run Web sites? I parse that as "of the machines that are running a web server application, what is the breakdown of the operating systems that they are running that web server on". Interesting reading. Thank you Sam! So there is one chart, depending on how you interpret it, that would support Andersons's claim. I guess if you were trying to make the point that Microsoft "learned" to compete with free then that's the number you would choose. Seems a tad disingenuous, but I'll accept that there was at least one source to support it.